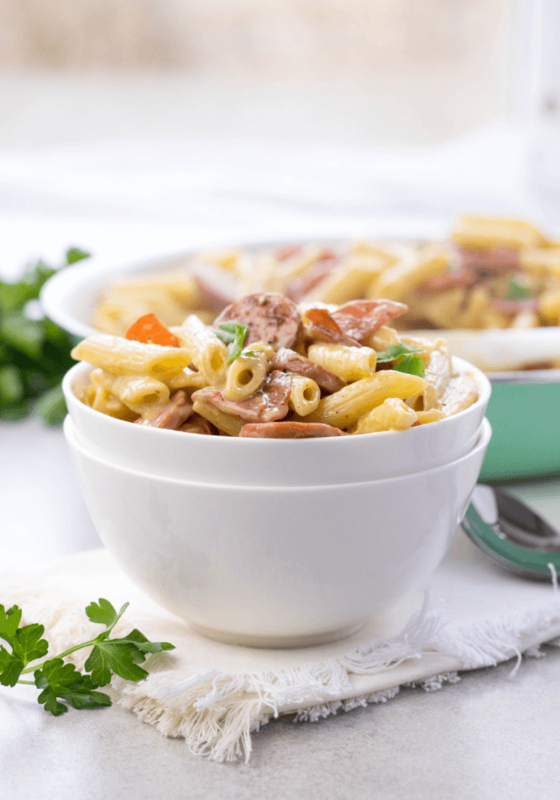 Sausage Pepperoni Penne is made with smoked sausage, turkey pepperoni, cream of chicken, milk, and penne pasta flavored with salt, pepper, crushed red pepper and garlic for a simple family dinner on the table in less than 30 minutes any day of the week. 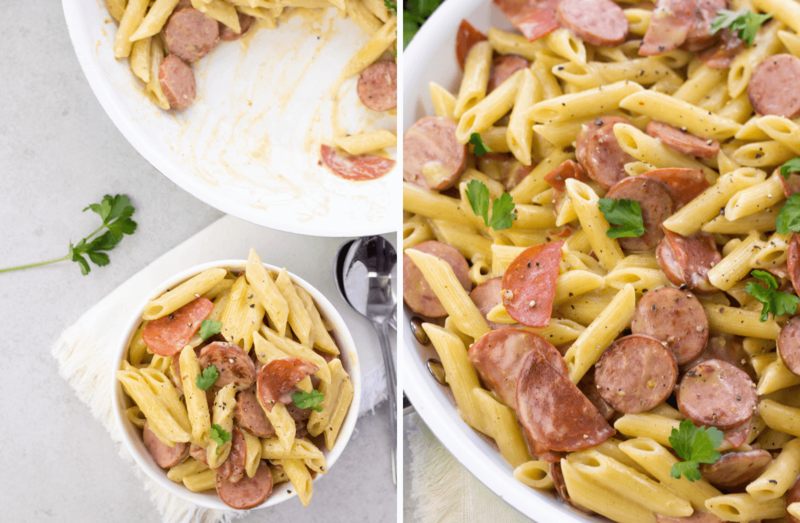 Sausage Pepperoni Penne is one of the family’s favorite go to budget friendly meals for busy nights taking less than 30 minutes to get on the dinner table. 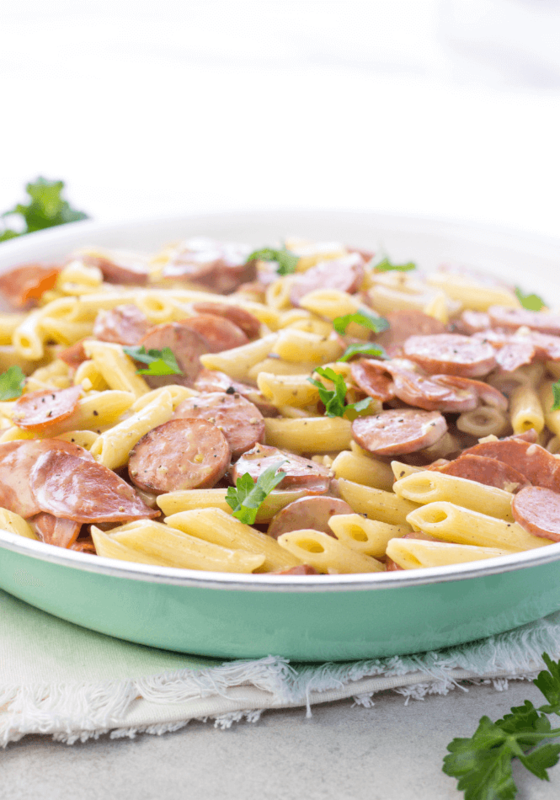 A few simple ingredients thrown into a pan create a creamy pasta dish with lot’s of sausage and turkey pepperoni with lots of garlic and a kick of red pepper flakes. This dish also happens to be one of the only meals I will eat as leftovers- it might actually be even better heated up the next me so make a big batch and take some to work the next day. 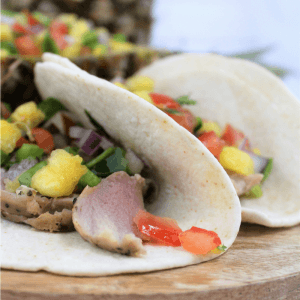 This recipe will feed our family of four for dinner with 1 or 2 servings leftover. Let’s just get to cooking! This dish is all about the simplicity but still a really comforting, meaty, tummy satisfying meal. 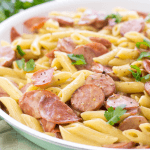 Sausage Pepperoni Penne start with a skinless smoked sausage and I like to use a turkey sausage normally to keep it somewhat lean, pasta noodles which any pasta can be used but we really like penne or sometimes rigatoni, and turkey pepperoni. I recommend the turkey pepperoni to keep the dish lighter but a regular pepperoni can be used. The only seasonings in this dish come from salt, pepper, a tiny pinch of red pepper flakes and minced garlic but it is not short on flavor. 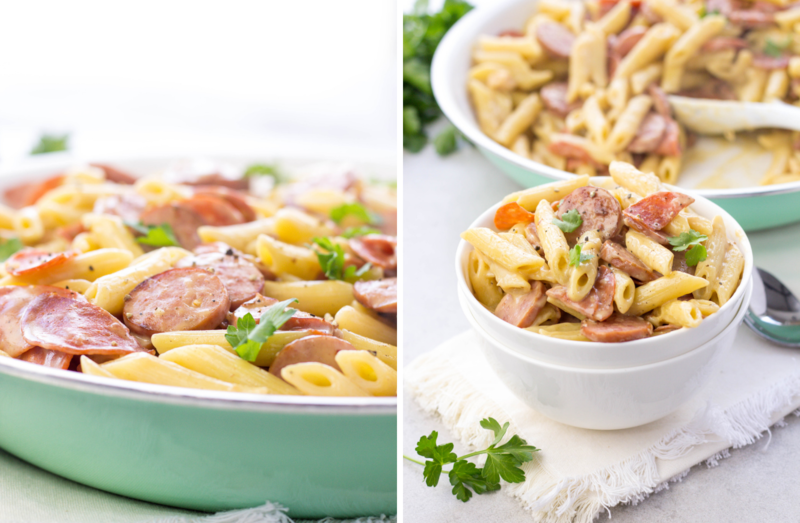 Grab the recipe below for this Sausage Pepperoni Penne and make sure to come back and comment if your family enjoyed it as much as mine does. Slice sausage and cut pepperoni into halves. Mince the garlic. Fill a large pot of water and place on the stove top on a medium high heat to bring to a rapid boil. Add a drizzle of olive oil and a pinch of salt to the water. Cook penne noodles according to package instructions. Drain. At the same time the pasta water is put on the stove top, heat up a large nonstick pan ( I like my 12 inch fry pan) on the stove top on a medium-high heat. Once the pan is hot, add a small drizzle of olive oil followed by the sausage and pepperoni. You want the meat to sizzle a bit and cook until it is nicely browned turning often. This should take about 5 minutes. If your meat stops sizzling, add a tiny bit of the pasta water to the pan. Add 1/2 teaspoon salt, 1/4 teaspoon pepper and 1/4 teaspoon red pepper flakes on top of the meat. You can adjust the red pepper flakes to how spicy your family likes food. Move the meat to one side and add another very small drizzle of olive oil. Add your minced garlic on top of the olive oil and cook for 1 minute or until fragrant. Stir the garlic into the meat. Add the can of cream of chicken, followed by the milk. Stir well and bring to a low simmer. Remove from heat. 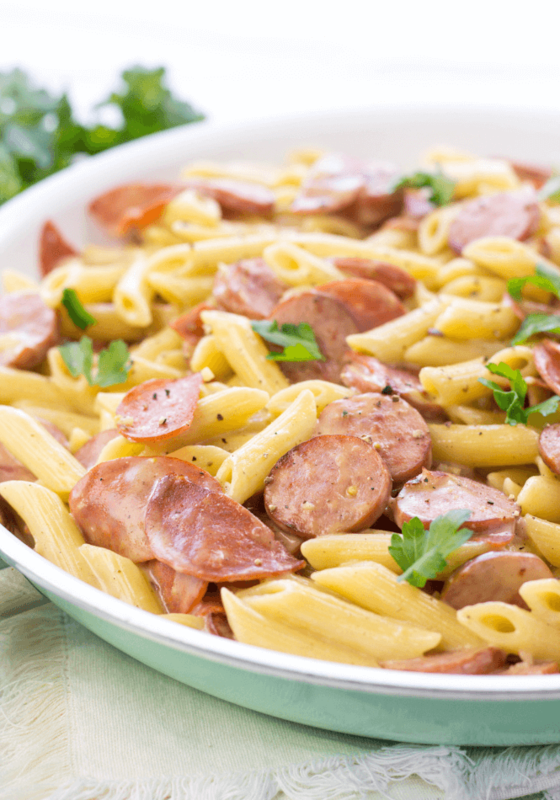 Once the pasta is finished cooking, drain and add to the pan of sausage. Stir everything together and let sit for about 5 minutes to cool down and thicken before serving. Sprinkle with parsley if you would like. Sausage and peppers are a favorite for us! I never thought of adding pepperoni to pasta though! So good. I add pepperoni on salads too. My kids are meat eaters! Oh yum! I will be trying this out! Most definitely! Looks so good! Definitely a must try! Yum! Give me all of the pasta! This looks so yummy! I’ve been searching for some new and different recipes for dinners, this will be perfect this week! Thank you!! Its a great addition to the quick and easy meal line up. Oh my gosh this looks and sounds delicious. Its the perfect thing to bring to bring to a party, thanks for sharing. This looks delicious! We make pasta with sausage a lot, but never with a cream sauce like this. We’ll have to give it a try, especially with the pepperoni! Thanks for the recipe!